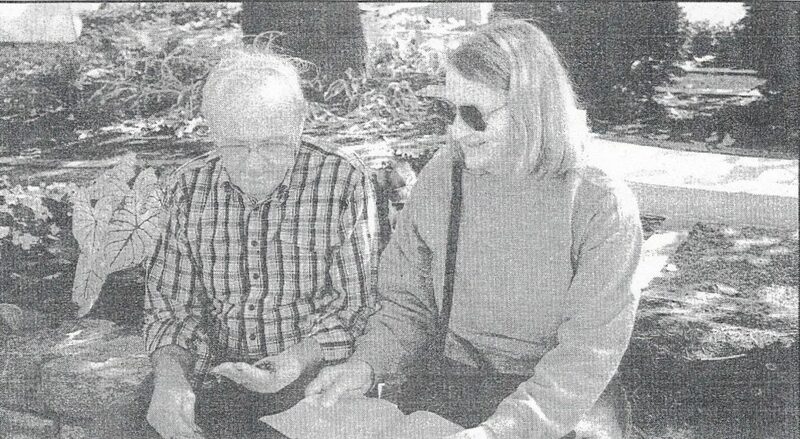 Doris Burton and her husband, Dallas, stop and relax for a moment during a walk. By Regina Villiers. Originally published April 14, 1993 in The Suburban Life, added April 12, 2019. Since both my sons spent their childhood years in Madeira, in the late ‘60’s and 70’s, I suppose I offer a prejudiced view; but it seems to me that Madeira was the best of places for a child to be a child. But was it always so? And is it still the same? Doris Burton gives a vivid account of the way it was to be a child in Madeira in an earlier time, in the 1930’s and 40’s. Doris has lived in Madeira since she was two years old. Her recollections portray a rich childhood of simple pursuits and a picture of what Madeira was like then. She went to school at the Madeira Primary School at the corner of Camargo and Miami. The school had two floors of classrooms and a basement, where the children sat on wooden benches to eat their lunches from long, wooden tables. Hanging on the wall of her second grade room was a picture of the young Duke of Windsor, Edward VIII, before he abdicated for his beloved Wallis Simpson. It shared space with a portrait of George Washington. The playground was huge, with lots of swings and a long, fast slide, if you used waxed paper to go down. There was a basketball court, and beyond it, more swings with a collection of rings hanging at different lengths. You’d hang from them and go round and round a center pole. After a lot of head injuries and broken arms, these were taken down. Beyond this area was a large ball field. There was lots of space for games. The girls played hopscotch, jacks, and jumping ropes. The boys played marbles and mumblety-peg, a rather dangerous game played with jack knives. They played many circle games, Button Button, Bringing Home the Bacon, Fox and Geese, Run Sheep Run and Farmer in the Dell. No one like being the “Cheese” at the end of this game. Indoors, on rainy days, they played Pick Up Sticks, and they played Tic Tac Toe or Hangman on the blackboard. They also played Musical Chairs, with the teacher playing the piano. The cloak (coat) rooms were used for hanging outer garments and for storing galoshes and umbrellas. Chalk and supplies were also kept there. Away from school, fun and games continued for Madeira children when Doris was a child. In winter, they skated and sledded. One winter, rain fell on top of snow and froze, turning the whole town into a skating rink. They skated along the streets and sidewalks on ice skates. But Doris remembers best the simple pleasures of her long, childhood summers. The iceman’s arrival was a big event. They’d get slivers of ice from the block of ice and crush them for a cooler. After a rain, water would run in the ditches, and the children would wade barefoot in the cool water. Often they’d find old coins, exposed by soil erosion. She can remember finding Liberty Head nickels, Indian Head pennies, and even Flying Eagles and some of the old, large-sized pennies. They played ball and flew kites on the vacant area at Dawson and Miami, now Madeira Crossing. Fireworks and carnivals were held there, and it was also the spot where the fire department tested their equipment, sending high-arching sprays of water across the open field. A swampy spot on Dawson road was a great spot to look for “critters” – frogs, tadpoles, snakes, and turtles. Doris, always a nature girl, collected lots of them. She remembers Fourth of Julys – making homemade ice cream and icing a watermelon in the laundry tub. She remembers the fireworks – punk, sparklers, flowerpots, snakes, and Roman candles. Weekends were family times. On Sundays, they’d go to see her grandparents who lived on Western Avenue near Crosley Field. Friday night was spent anticipating Saturday, the big day. That was the day they went into Madisonville, which was the “city” then. Madeira didn’t have many businesses. They went to Madisonville to the dentist and to the optometrist. When she had to have shoes, she remembers the shoe store there with the x-ray machine that turned you feet green. The first supermarket she remembers was Albers in Madisonville. Every Saturday morning, the whole family would go to Albers and load up the car with groceries. Afterward, they’d stop at Mueller’s Bakery, where they’d buy a butter cake and square, dark, powdered sugar-covered doughnuts. They also made a weekly trip to the Madisonville Library. This was the week’s highlight for Doris. Sometimes, she and her brother were allowed to go to a Saturday matinee movie in Madisonville. For 10 cents, they would see a movie and a continuing serial, like Flash Gordon. The community fun she remembers most were the Halloween parties held at the old Presbyterian Church. Her mother, who was artistic, would always win prizes for costumes. One time, she dressed Doris as Mae West. Doris, about eight, wore her grandmother’s black beaded, pointed-toe, Louis-heeled shoes. They killed her feet, but she won. Her prize? A box of chocolate-covered cherries, which Doris despised. Her mother would take her by bus to drawing lessons at the Art Museum in Eden Park. While Doris sketched, her mother would enjoy the art or use the museum library. The drawing lessons took effect. Doris is now a nature artist. Her nature-inspired ceramics and pottery are sold at many places, including the Cincinnati Nature Center and the Cincinnati Zoo gift shops. Though the times and the physical features of Madeira have changed since the childhood of Doris, or even of my own children, I Iike to think that Madeira is still one of the best places to be a child.